I have had the pleasure of living with more money, and the joy of living with less. I will tell you that it’s always easier to spend more than less. No matter how much money you make, it’s difficult to ratchet back your lifestyle. Your motivation for cutting your spending may be voluntary (you’re saving for something big) or forced (you lost your job). No matter the reason, accept that there is no magic formula or simple solution to cutting your spending. Your success will depend upon your willingness and ability to exercise self-control and discipline. The following are a few principles and techniques that you may find helpful. Cash – Generally, you will spend less money if you pay cash. You can also implement an envelope system Dave Ramsey highly recommends. Basically, you put cash in various envelopes for each type of expense and only spend what’s in the envelope. For instance if you have a clothing envelope, you only buy clothes with the allocated cash. When the cash is gone, you stop buying. Cheaper Options – Review your budget to see how you might maintain a type of service, but use a cheaper option. Cable tv and cell phones are good examples. Do you really need the DVR, movie channels or the unlimited data plan? Eliminating options and extra services can cut your bill by 25-50%. Having all the bells and whistles may be nice, but it may not be worth the added expense. 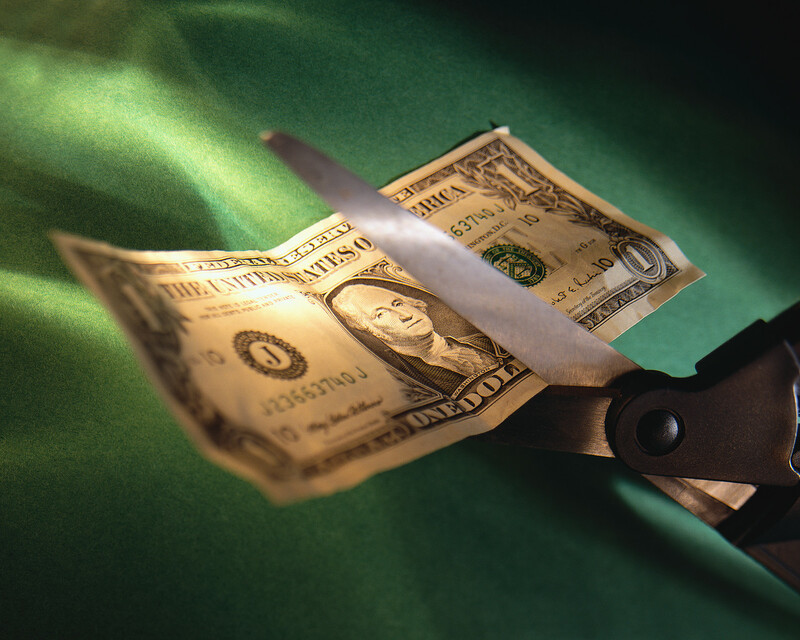 Cutbacks – Rather than completely eliminating expenditures, reduce the frequency. Entertainment is a great example. You can still go to the movies or eat out; just don’t do it as often. Go once a month, rather than once a week. You may be able to really curtail your spending if you cutback the frequency and select a cheaper option. Eliminate – Completely eliminating an expense can be the hardest thing to do. Unless you like to throw away money, you obviously had a reason for spending the money in the first place. It can be difficult to let something go. Acknowledge the sacrifice you are making, but keep in mind that’s it’s less important than one of your higher priorities (like paying your mortgage). No doubt, curtailing your spending is hard. Changing behaviors and sacrifice is never easy. You may not get it right every time, but don’t give up… and don’t keep overspending. It may take a little while, but you can control and cut your spending if you remain focused and diligent. Hint: Stay more focused on what you are going to gain by cutting your spending than what you are losing. It will be much more difficult if you are constantly thinking about what you can’t have or can’t do. Far better for you to think about what you’re going to achieve. It will be your reward for trimming your spending and managing your money well. Open up your wallet and pull out what you have in cash (hopefully you have some). Look at the various bills in your hand. They all have an identical shape, size and feel. The only difference is what’s printed on them, but the printing can make a huge difference in the value of the paper. Imagine if you lost one of those bills, you would probably react differently if it had $100 printed on it rather than $1. Investopedia.com defines money as a commodity or asset, such as gold, an officially issued currency, coin, or paper note, that can be legally exchanged for something equivalent, such as goods or services. The value of money is not in the paper or coin. The real value is what you can acquire with the currency. The more money you have, the greater value you can purchase, either in quantity or quality (i.e., $10,000 could buy you 50 decent Seiko watches or 1 Rolex). The way you handle your money says a lot about who you are as a person. Give me about 30 minutes with your checkbook, and I will have a good idea what you value based upon how you spend your money. Would that make you proud or embarrassed? Fortunately, you don’t have to justify your expenditures to me (although you may have some explaining to do with your spouse). If you’re like most people, your money supply is limited. Impulse buying and spending money for things that have little value once purchased can diminish your ability to acquire something in the future that is necessary or more important to you. In deciding how to spend your money, you should try to maximize your purchases for those things that have value for you today and in the future. If the value of money is what it can acquire, make sure you’re acquiring something you value. Prioritize your spending to match your priorities in life. Coming up next… Currency & Commerce in the Value of Money – Part II.